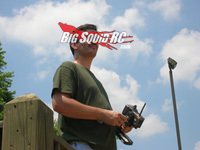 ASK Cub Reporter- 10.12.2011- Version: Reasonable Questions, Ridiculous Answers « Big Squid RC – RC Car and Truck News, Reviews, Videos, and More! Cubby– Since Thunder Tiger has gone to exclusive distribution through GP they’ve seemed to have really gain some traction (well that and thousands upon thousands of people reading their reviews here on BigSquid). In the past Thunder Tiger was nearly impossible to find, and goodness help ya trying to find replacement or hop-up parts. Now days you can actually find some of their products in an “average” LHS, you can actually get your hands on replacement parts, and the cars/trucks they are putting out have worked very well for us. You mention you popped in a Spektrum S6030 servo, that’s a good upgrade as the stock servo doesn’t have the torque needed to really slam around those huge front tires. And I’ll agree with ya the stock battery trays are a bit goofy, but ours worked fine. The only other mod I would really consider to be a “must do” for the Thunder Tiger would be to put 8k fluid in the center diff. Bone stock out of the box the front tires become pizza cutters way too easy, the 8k evens out the power putting more to the rears under hard acceleration. If anyone missed our Thunder Tiger MT4 G3 review, you can catch it at that link. Hi, I have a stampede vxl with rpm everything, and a blitz with the cc sct combo (v2 with 3800 4 pole), was contemplating selling both to get the savage flux, main terrain is skate parks, be good to get your thoughts?! Cubby– Assuming your Pede is the 2wd version, going to the 4wd Savage Flux opens up a lot trick options while driving a skate park. The gyro effect is much greater on a 4wd, especially one with tires as big as the Savage, making it much easier to pull back and front flips. The 4wd of the Savage will also allow you to tilt from side to side in the air (by steering to the left or right in flight), making it easier to flat land transfers. Lastly, the 8 shocks and ultra long travel suspension on the Savage will make all those cement landings at a skate park much softer. To boil it down, you are going to have a blast with the Savage Flux, it’s another level of performance over what you have right now. Yea.. this one is too long for the hand written stuff… so here ya go…. Bubba B. here. As you know, I run the first city owned indoor off road R/C track in the US. The Flowood R/C Indoor Park located in Flowood, MS opened December 1, 2010. You guys gave us some good publicity when we opened and have been a big supporter of ours during the year. I want to thank you for that. I have 160 members since opening. I made a prediction when we opened that within a year we would see more 1/8 electric running on our track than 1/8 nitro. Well, it is happening. I have never seen as many frustrated people having to deal with not being able to tune a nitro engine. First they spend hours tuning and running up and down the front straight getting it heated up, then just when they seem to get them tuned, they flame out in every qualifier or the main. I have also seen a lot of people get in our hobby with nitro and get out due to the fact they could not keep their engine running properly. There is now a great alternative. Electric. With the technology in speed controllers, brushless motors, and batteries, people are very successfully switching to electric 1/8 buggy, truggy and 4wd SCT. You guys do a wonderful job of keeping people informed and the testing you did on batteries was great. Almost all of our people are running the Gen Ace Batteries. It is no wonder for the price, it is the best thing going in R/C. I just want to say thanks for your helpful insight, we need more of this for all of us. We are hosting an all Electric Race Charge Em Up II this Saturday. I am certain we are going to be full at 150 entries. It is a one day race with practice all day, today, on the premiere indoor track in the southeast www.flowoodrc.com I am very excited about this race as we have some of the fastest guys from the southeast in attendance. A lot of them will be racing with us for the first time and get to see our facility. We are coming up on our first complete year and it has been truly awesome. The city has been behind us more than 100%. We have filled the hotels in our city at times and brought a lot of new faces to town. Send me your questions, comments, hate-mail, all the typical stuff to Cubby at BigSquidRC dot com!